Remember when video games were simple? Before co-ops and online gaming, we just had cartridges and two controllers. And Mario was the king of video game characters. He still is, but he was even more so when Super Mario World debuted on the Super NES in 1991. That game was even better than Super Mario Bros. 3, and it taught us some valuable lessons that we could all use as we grew into adults. Let’s take a look at 10 profound life lessons we learned from Super Mario World. In order to save Princess Toadstool and rid the world of evil, Mario literally has to change the world. He blazes a trail across the virgin land, forming roads, building bridges, and doing many other things to cultivate the land. In fact, if you beat all of the secret levels, you’ll permanently change the way the world looks, as well as many of its inhabitants. One man can have a big effect on the world around him. Never forget that you can have a profound impact on everyone around you by the example you set. Be a force for good and blaze a trail for others to follow. When Mario enters Haunted Houses and Castles, he has to leave his loyal friend Yoshi behind. Those places are where he faces his most dangerous challenges, and he must overcome them on his own. In life, your family and friends can only guide you so far, but when it comes time to be tested with moral dilemmas, it’s up to you alone to demonstrate your true character. I’m sure they’re rooting for you just outside, though. 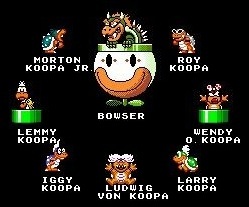 If Bowser had raised his children better, they might not have ended up being so cruel. The world would be a much better place if every child had two loving parents to wisely nurture and guide them through their formative years. Let’s be sure to pass on our good qualities to our kids and try to minimize our bad inclinations to kidnap royalty and build castles full of deathtraps for plumbers. Super Mario World levels have a time limit, but just about every level gives you more time than you’ll ever need to finish it. So you can take a minute or two to explore all of the pipes and find coins, mushrooms, feathers, and flowers – and then eat them. The same is true of life. We have a time limit here on Earth. We’re all going to die eventually, but most of us are given enough time to enjoy our lives and have some adventures along the way. So be like Mario and try some new, exciting things every day. After all, you are what you eat. 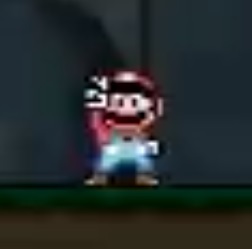 Mario can hold an extra mushroom, flower, or feather for later use in a box at the top of the screen. This extra item often comes in handy when he gets hit by an enemy. It’s always a good idea to be prepared for emergencies. Keep extra food, blankets, clothes, fuel, first aid, and other emergency supplies on hand just in case you need them. This is starting to sound like a PSA. It’s sound advice, though. Two players can play Super Mario World as brothers Mario and Luigi. They take turns and if one of them runs out of lives, the other can give some of his excess lives to his deceased brother. When we’re kids it’s an important lesson to learn to share because when we grow into adults we realize there’s a lot of good we can do by giving some of our excess to those who have less than us. You probably won’t be asked to give your life for your brother, but you should ask yourself the soul-searching question: Would I be willing? Deadly ghosts float closer and closer to Mario when he turns his back on them. But as soon as he turns around and looks them in the eye, they freeze and hide in shame. Many levels are meant to be beaten more than once. If you find the secret key or finish line in a level, you can open up new roads to the princess. It’s nice to be successful, but don’t let that make you complacent. Revisit your successes and pinpoint what you did right and what you could improve upon. Looking back might just help you open up new avenues to success. For example, when I go back and reread my work from a few years ago, I see plenty of room for improvement, and I use what I find to make my writing even better today. How does a fully formed Yoshi fit in such a small egg? 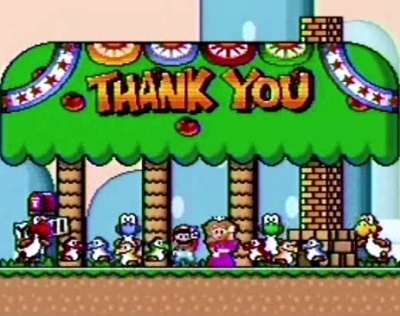 Who cares because all that matters is that Yoshi is one of the most useful sidekicks in video game history. Plus, different-colored eggs yield Yoshis with unique powers of breathing fire, flying, and stomping hard, respectively. Try not to judge people too much when you first meet them. Give them time to show their true colors as they demonstrate hidden talents. After Mario defeats Bowser and rescues Princess Toadstool, the two of them take a well-deserved vacation together on Yoshi’s island. Life can be stressful. Remember to unplug every once in a while and enjoy some private time with your loved ones. Even the bravest heroes need to relax sometimes. I hope you enjoyed this departure from my usual discussion of film. If you’ll excuse me, I’m going to enjoy some old-fashioned, character-building fun with Super Mario World. All images are the copyright of their respective owners, especially Nintendo of America. This entry was posted in Random Stuff and tagged nintendo, super mario, super mario world, video game. Bookmark the permalink.